1 of 3 Heat oven to 400 degrees F. Coat a baking sheet with nonstick cooking spray; set aside. Whisk broth, ketchup, mustard and cornstarch; set aside. 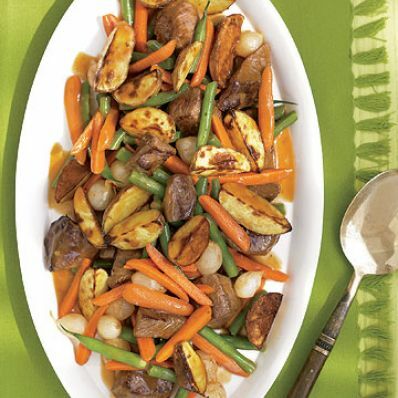 Cut potatoes into 1/2-inch wedges; place on prepared baking sheet and sprinkle with 1/4 teaspoon of the garlic salt and 1/8 teaspoon of the black pepper. Bake at 400 degrees F for 20 minutes or until tender. Remove from oven and set aside. 2 of 3 Trim beans and cut into 2-inch pieces; cut carrots in quarters lengthwise. Place in a large skillet; add onions and 1/4 cup water. Cover; cook on medium-high heat for 5 minutes. Remove lid and cook until water is gone. Remove vegetables and keep warm. 3 of 3 Add oil to skillet and heat over medium-high heat. Sprinkle sirloin with remaining 1/4 teaspoon garlic salt and 1/8 teaspoon black pepper and add to skillet. Cook for 3 to 4 minutes. Pour broth mixture into skillet; boil for 1 minute or until thickened. Stir in vegetables. Add potatoes to skillet and gently toss to coat. Per Serving: 29 g pro., 335 kcal cal., 762 mg sodium, 5 g fiber, 2 g sat. fat, 68 mg chol., 9 g Fat, total, 35 g carb.